Britain has many earth buildings across the country, going by different names in different regions. Cob is the term used in the west country. Cob buildings need to be repaired with the correct materials and well maintained and can last hundreds of years. 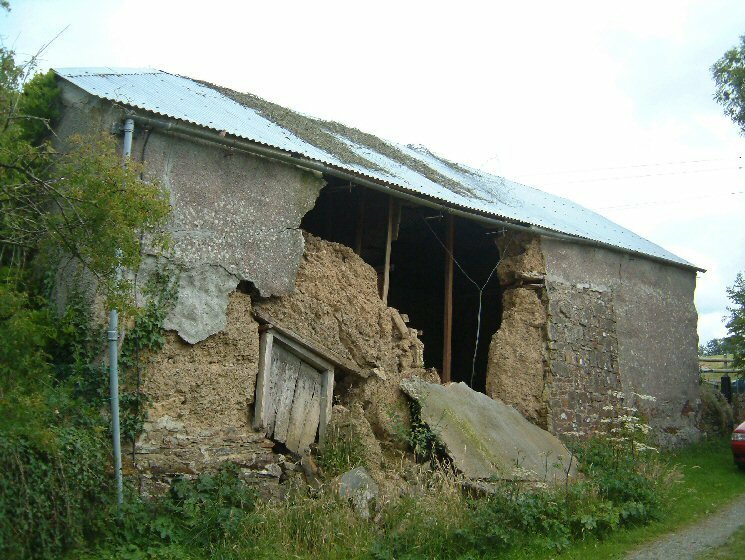 There are no exact figures but certainly hundreds of cob buildings have been lost in the last dozen years due to poor maintenance or the wrong materials such as this example. The overhang of this roof is poor, so cannot adequately take the rain water away. At least some of the repairs have been done with cement. The render is a hard cement render that has cracked and can allow moisture to saturate the walls and seriously effect it’s structural integrity. In this case, the neglect and wrong materials resulted in major failure. Fortunately, although the damage was severe, Mike Wye & Associates were able to rebuild the wall in mass cob once more and use green oak timber in the repair work.